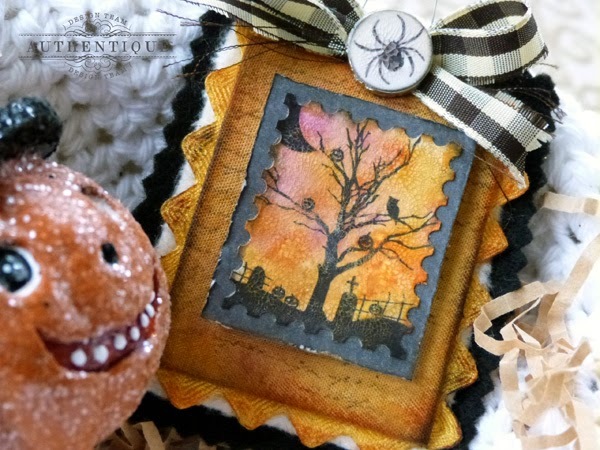 Hi everyone, today I have a fun Halloween project and tutorial to share with you for creating a vintage-inspired holiday ornament using our new Spirited collection. I love to decorate my home for the seasons and holidays, and Halloween is definitely at the top of my favorite times of year. Today's project combines two of my longtime passions, playing with paper and playing with fabric. 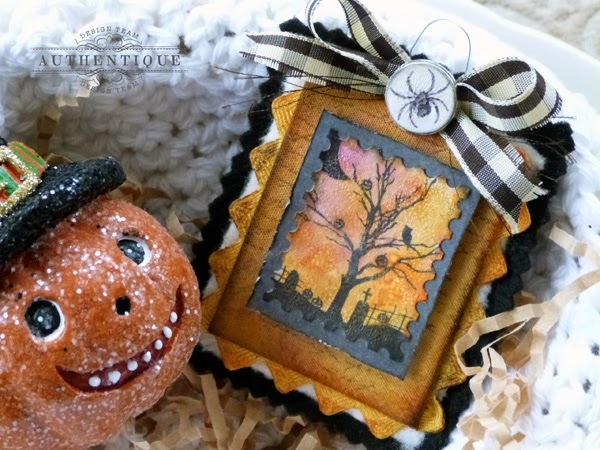 I matched the two up to create a fun, shabby chic Halloween ornament that would be perfect for hanging on a spooky tree branch, or just propping up in a bowl to add a festive spirit to your holiday home. 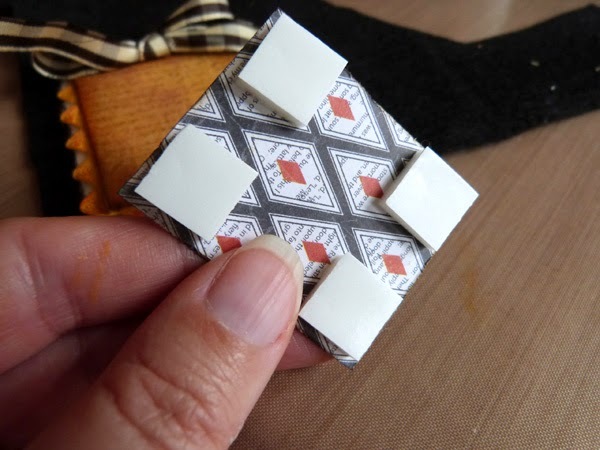 This little ornament is very easy to create, and only requires a minimum of paper supplies and fabric scraps, along with a few Distress Inks or Stains. For my ornament, I only used one Details cardstock sticker, one tiny Components die cut, and a small scrap of 6x6 Bundle paper. With all the adorable stickers and die cuts available in the Spirited line, just think of how many ornaments you could produce! I've taken lots of photos of all my steps to create this distressed and shabby look to share with you. So let's get started. First, gather some supplies. 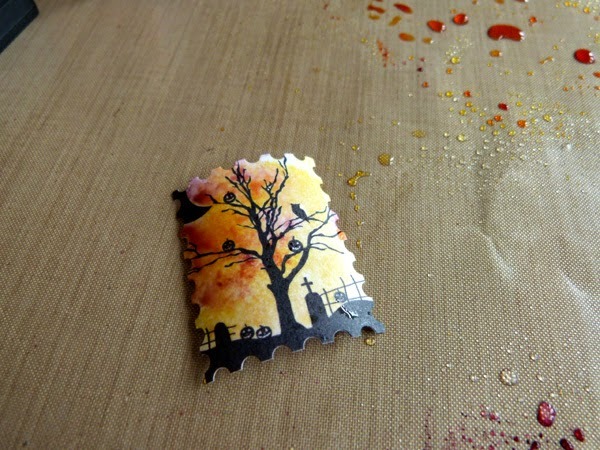 You will need two pieces of blank chipboard that are slightly larger than your focal sticker or die cut, along with a variety of Halloween-colored Distress Inks or Stain. 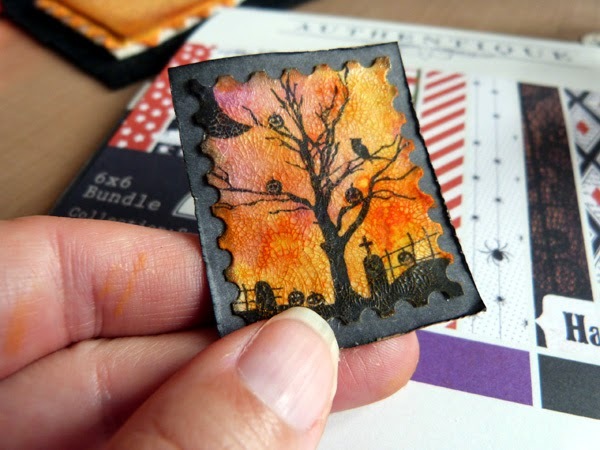 For my project, I used the fun graveyard scene postage stamp sticker from the Details sticker sheet, so I cut my chipboard pieces to 2" x 2.5". 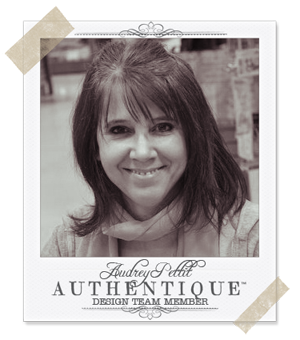 If you use a larger embellishment, you may need to adjust your dimensions. For the Distress colors I used Wild Honey, Spiced Marmalade, and Seedless Preserves. 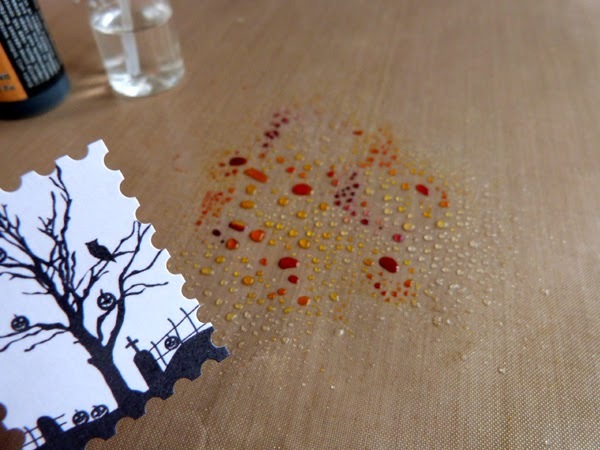 Dab the Distress colors onto a craft sheet, then liberally spritz the inks with water. 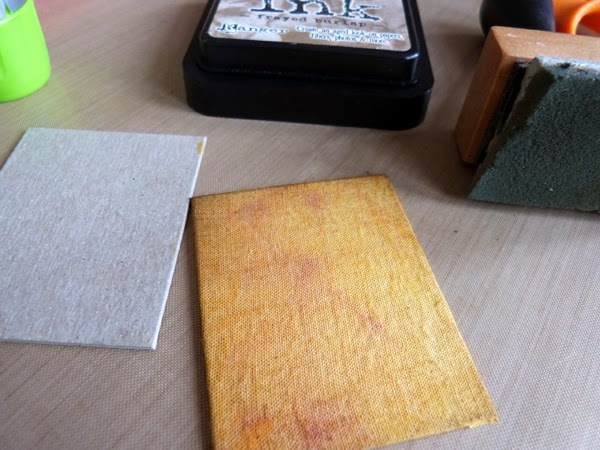 Drag the focal sticker through the ink mixture, then allow to dry completely. You can repeat this step until you get the color intensity you like, if needed. Once the ink is completely dry, brush a thick coat of Distress Crackle Paint over the entire image. As the crackle paint dries, fine lines and cracks will appear. Set the image aside and let it dry completely. 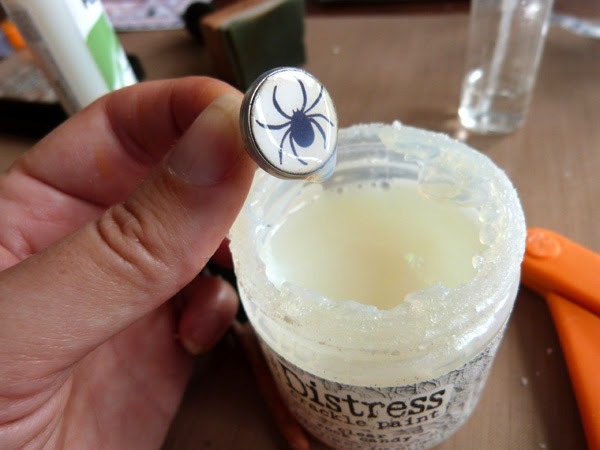 Dab the Distress Inks onto a scrap piece of cotton fabric or muslin. 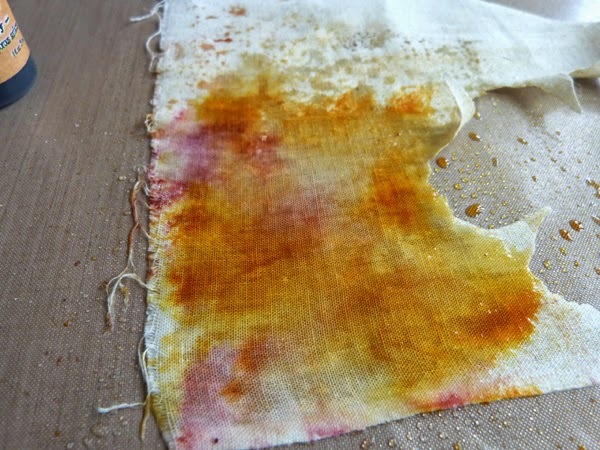 Spritz the fabric liberally with water to allow all the inks and stains to blend. 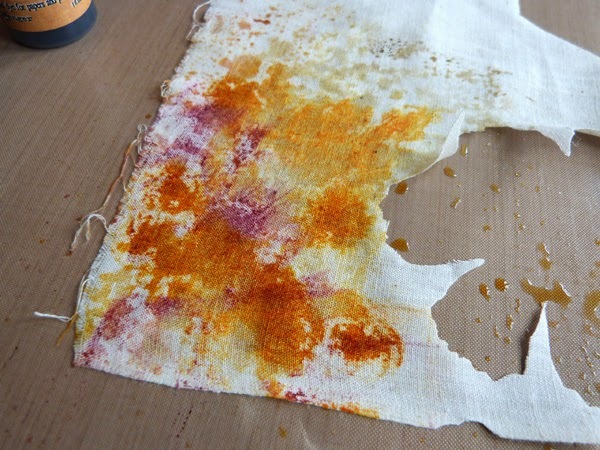 Mop up any remaining ink on your craft sheet, then set the fabric aside to dry. You can also speed this process up with a heat tool, if desired. 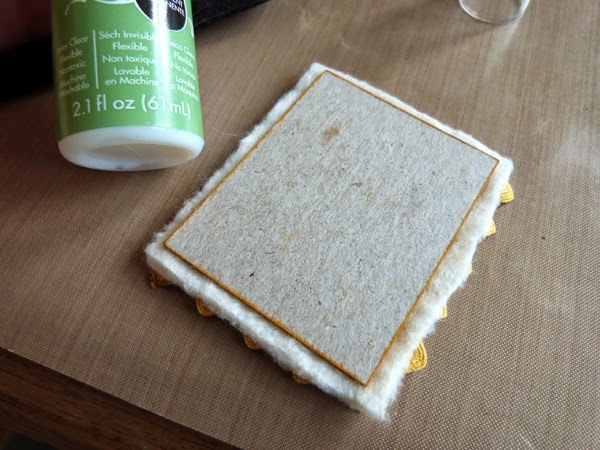 Cover one of the chipboard pieces with glue stick. I like to use Therm O Web's SuperStik glue stick. 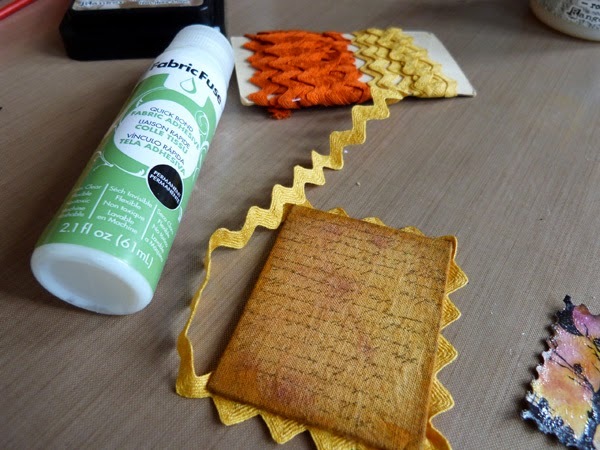 Trim the dry fabric down to slightly bigger than the chipboard, and apply the fabric to the chipboard, folding the excess around and securing on the back. 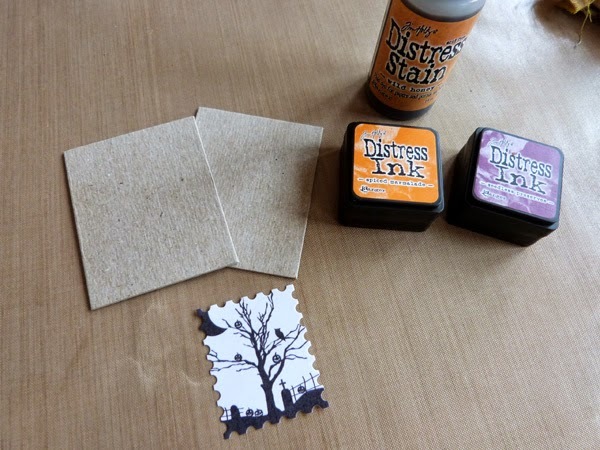 Distress the edges with Frayed Burlap Distress Ink and an ink blending tool. 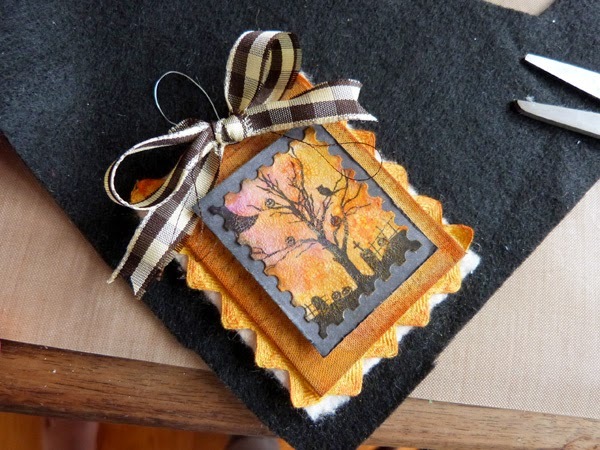 Stamp a script image onto the fabric using Frayed Burlap Distress Ink. I used one of Authentique's fun co-branded stamps with Hampton Arts. Adhere trim onto the backside of the fabric panel using strong tacky glue. I like to use Therm O Web's Fabric Fuse glue. Adhere fabric panel onto a piece of cotton batting, then onto the remaining piece of chipboard. 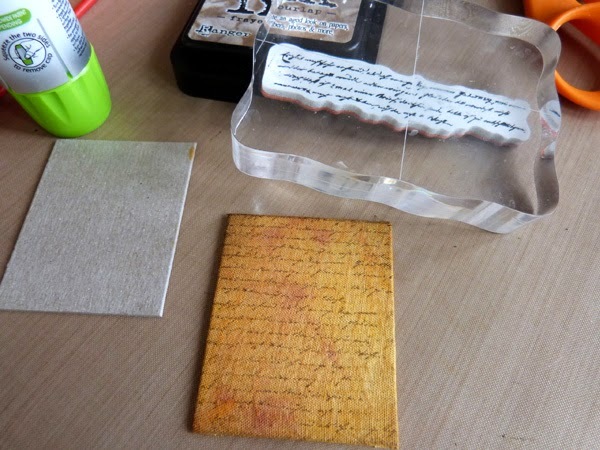 Adhere your crackled image onto a small piece of patterned paper. I used solid distressed black paper from the 6x6 Bundle. Drag your fingernail around the edge of the paper to give it a worn finish. 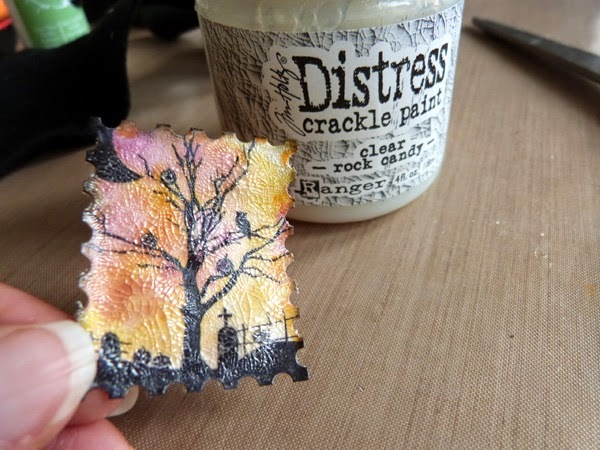 You can add additional Distress Ink or Stain over the top of the image to bring out more of the crackle glaze, if desired. 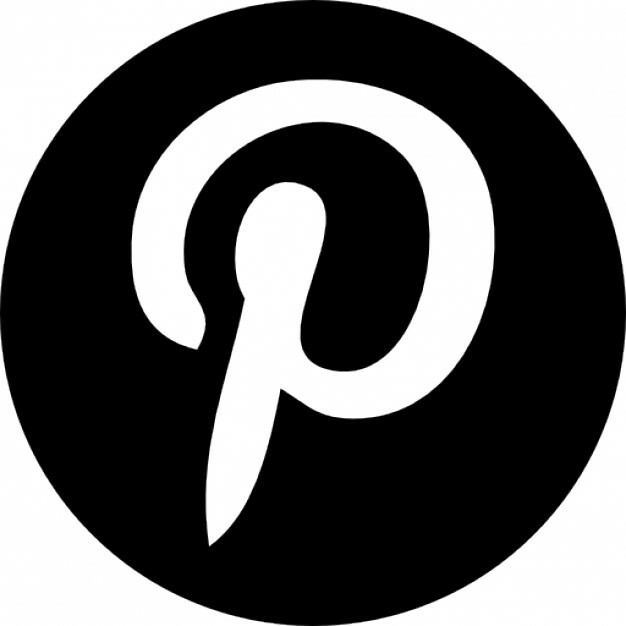 Add foam adhesive squares onto the back of the image, and adhere to the center of your fabric panel. Twist a small loop of wire to create a hanger for the ornament. Adhere wire onto the back of the fabric panel, then adhere the entire panel onto black felt. Add a ribbon bow to the bottom of the hanger. Trim around the black felt with pinking shears. 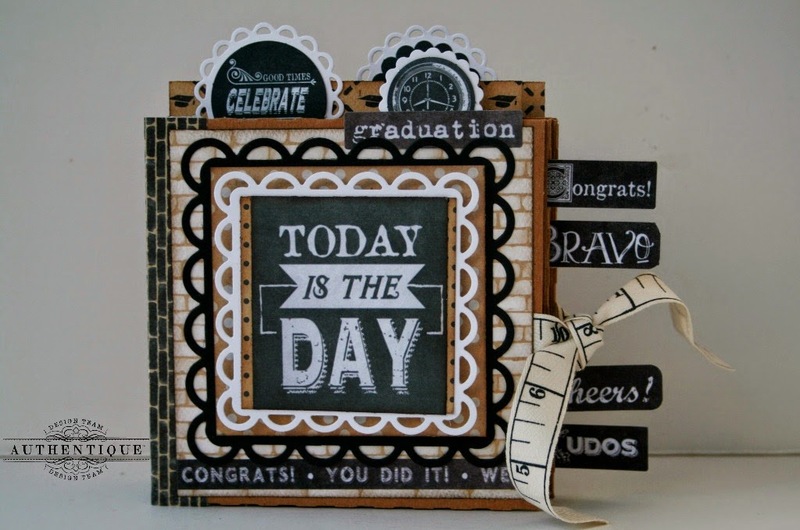 Remove one of the small circle die cuts from the Components die cut sheet. 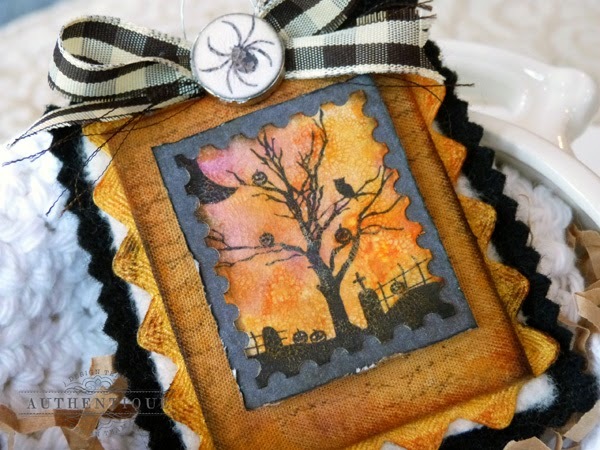 Adhere die cut to an Epiphany Crafts brad blank using the Fabric Fuse glue, then dip the brad into the Distress Crackle Paint. Allow to dry completely before affixing the brad to the center of the bow. This turned out just wonderful! I love the postage stamp that you made. Great tutorial ! Fun project ... must try some of these techniques! My local store did not have your Halloween Collection :( ! That is such and awesome idea. great, I want to try this. So cool!!! 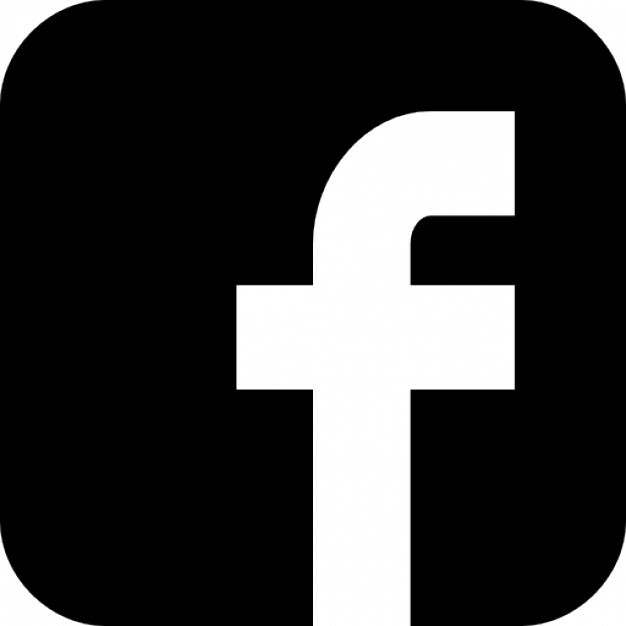 Such a fantastic project. Love it. 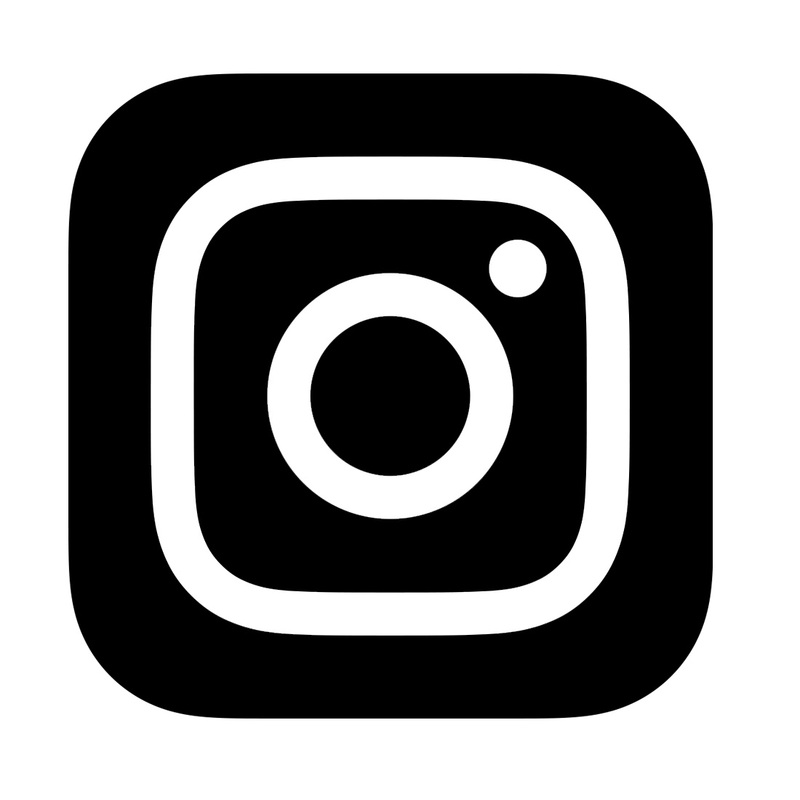 This project is amazing! I love it! love, love, love the ornament! Delightful! Going into the Halloween bookmark folder so I can one of these cuties!